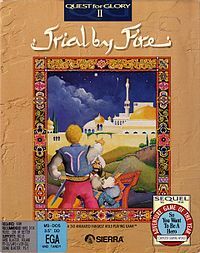 Quest for Glory II: Trial by Fire is the second game in the Quest for Glory series. In this adventure/RPG hybrid, the hero travels to Raseir to resurrect a powerful magical being. Quest for Glory II is now supported by ScummVM, a program designed to let 2D adventure games run on multiple platforms. With ScummVM, Quest for Glory II now runs on modern versions of windows, as well as Linux, Mac OS X, and many consoles such as Dreamcast, Wii, PlayStation 2, and PlayStation Portable. For a complete list of platforms supported by ScummVM, see here. In 2008 a fan remake was created by AGD Interactive. It was made with Adventure Game Studio in the style of Sierra's later SCI remakes, and had enhancements to the interface, graphics, and music. AGD Interactive was granted a fan license to create their fan games from the license holders of the Sierra franchises, Activision. This remake is available for free from AGD Interactive.